After dropping off JuJu and RBC at Brit, fresh from our brunch at the Alibi Room, I proceeded to head home. Whilst driving along Hastings, I quickly pulled into the 7-11 parking lot. If you were thinking of Slurpee, think again. Rather, it was a pit stop for some Chinese buns. Okay, okay, I know, Hastings and Chinese buns... I know what you're thinking. No, I didn't go for those type of buns. 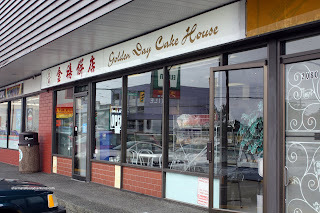 I'm talking about Chinese pastries. Although chain bakeries such as Maxim's, Pine House and Anna's fit the bill, I find that their bakery items to be getting to be boring. They seem to be shrinking in size (esp. Maxim's) and going up in price. Thus, it has led me to find other places for my fix. There have been pleasant surprises such as Karmony and 1st Ave Bakery. 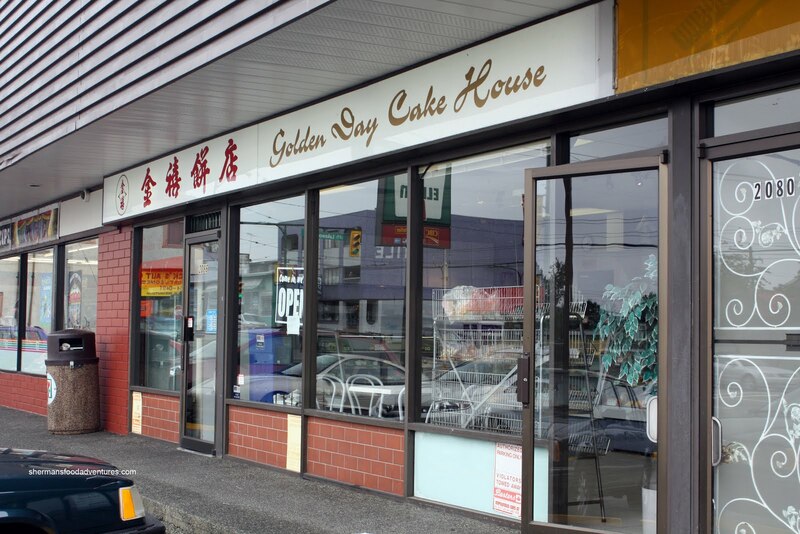 So, I though that it was time to give Golden Day Cake House a go. While I was getting my order, of all people, JuJu walks in. Apparently he had the Chinese bun urges as well (that just sounds awesome). The first thing that struck me were how big the buns were! I love big buns! And they were very inexpensive. 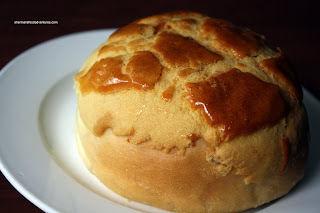 Cheap big buns! You gotta love that. So for only a measly $9.00, I got 6 Egg Tarts, 4 BBQ Pork Buns and 4 Pineapple Buns. Once I got home, I needed to try some. I was pleasantly surprised that the Egg Tarts were still warm (very fresh outta the oven). I really wish that the tart shell would've been flakier; but the filling was pretty good. Only semi-sweet while exhibiting some residual egg flavour, this was a decent egg tart. 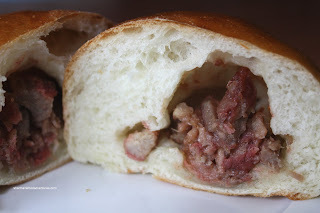 Then I proceeded to slice the BBQ Pork Bun in half. As you can see, there is only a modest amount of pork in the bun. Mind you, that modest amount was very good. Not over-sauced or over-seasoned, the filling tasted like BBQ pork. I also really liked the airy, slightly chewy bun. 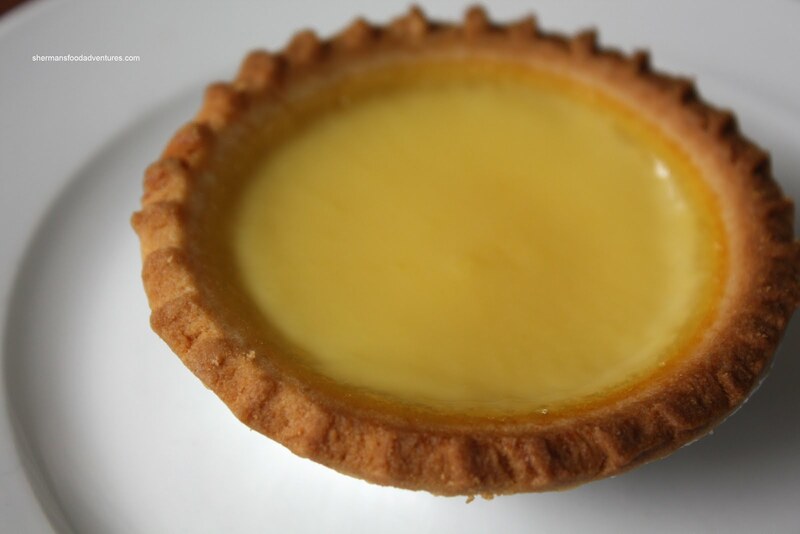 The egg tarts at New Town Bakery in Chinatown are pretty flaky and awesome when they're hot. Good apple tarts too. The best pineapple buns are in Richmond at LIDO cafe. They come out fresh every 15-20 minutes and sell out quickly. They also have butter pineapple buns in case you need more fat in your diet. Yup, have had the egg tarts fresh from NT. Very good and they're big too! The apple tarts are legendary at NT, no one does them better! Dai Bao is good too! Yah, everytime I head over to Lido, they sell out! Doh!